Originally published in Creation/Evolution 16:31-43, 1985, by the National Center for Science Education. In 1922, solely on the basis of a worn fossil tooth from Nebraska, paleontologist Henry Fairfield Osborn described Hesperopithecus haroldcookii as the first anthropoid ape from North America. Five years later, Osborn's colleague William King Gregory concluded that the tooth most likely came from an extinct peccary. During its brief life, Hesperopithecus provoked intemperate speculations about its relation to humans, including a "reconstruction" of "Nebraska Man" by an artist in a popular British news magazine. The Nebraska tooth also sparked some memorable exchanges between Osborn and William Jennings Bryan, from whose home state the tooth had come. Osborn apparently began to have doubts about his identification of the tooth shortly before the Scopes "monkey trial" in July 1925, and he stopped mentioning it in his publications. It seems likely that the crumbling of the Fundamentalist assault on evolution in the years following the Scopes trial prevented the Hesperopithecus affair from becoming a serious embarrassment to evolutionists. Although Nebraska Man did not survive long enough to become widely accepted by the scientific community and was quickly forgotten when its true identity was recognized, Hesperopithecus is again being trotted out in the current recrudescence of creationist attacks on evolution. The creationists who belittle mistakes by scientists cannot admit that science advances, in part, by correcting error. In 1917, rancher and geologist Harold Cook collected a human-looking tooth in Pliocene (recently redesignated Miocene) sediments in northwestern Nebraska. In March 1922, Cook submitted the specimen to Henry Fairfield Osborn, President of the American Museum of Natural History and an eminent vertebrate paleontologist, to determine the tooth's affinities. Osborn received the tooth on March 14, 1922. He wrote to Cook: "I sat down with the tooth and I said to myself: 'It looks one hundred per cent anthropoid'." (Osborn, 1922b, p. 2) One month later, Osborn announced Hesperopithecus haroldcookii as the first anthropoid ape from America. Forestier's reconstruction of Nebraska Man was not reproduced in any other contemporary publication and has only recently been "rediscovered" and reprinted by critics of evolution (e.g., Hitching, 1982; Bowden, 1981; see also Fix, 1984). Field work resumed in the spring of 1925 at the site where Cook had found the original Hesperopithecus tooth in 1917. It was material uncovered at the site during 1925 that undoubtedly sowed the seeds of doubt about the true possessor of the Nebraska tooth. As evidence accumulated in subsequent field seasons, Gregory became aware that, despite the tooth's uncanny superficial resemblance to an anthropoid molar, Hesperopithecus was probably an extinct peccary. Gregory announced his retraction in Science at the end of 1927. (Gregory, 1927) The self-correcting feature of science thereby aborted America's only entry in mankind's prehistoric lineage before Nebraska Man significantly affected opinions of most scientists regarding human evolution. Misidentifications and misallocations of fossil specimens are quite common in the paleontological literature. After publication, these errors are subject to examination by others in the field and corrections are made in print, usually without fanfare. Some of the misidentifications are ludicrous: a fossil whale first identified as a giant reptile, rodents misidentified as primates, carnivores as ungulates, ungulates as anteaters. The list is endless, but the public nature of science leads to quick corrections, particularly when the biological group in question is under intense study by a number of competing workers. To prevent embarrassing errors when a new but incomplete fossil is found, most paleontologists and anthropologists will make a tentative identification of a specimen and await further discoveries for confirmation of their find. Overly cautious individuals await complete skeletons and may never publish their finds, whereas more reckless ones will establish new species, genera, and families on fragmentary evidence. First, the circumstantial evidence of some of the other fossil specimens associated with Hesperopithecus made the existence of a North American Pliocene hominid a distinct possibility. A fossil antelope, an animal otherwise native to Africa and Asia, was discovered in the same strata that produced Hesperopithecus. If an antelope could migrate from the Old World tropics to North America in the Pliocene, why not a hominid? Secondly, the sediments that yielded the tooth also contained abundant bone fragments and splinters that looked extraordinarily similar to bones that had been worked and shaped by unquestionable humans in the later Pleistocene (or Ice Age) of Europe. As it turned out, the "worked" fragments from Nebraska were produced when hyaena-like dogs crushed and split bones to obtain marrow, in the same way that African hyaenas feed today. To Osborn and his field workers, however, it looked as if a human culture existed and was preserved in these sediments. Thirdly, the morphology of the fossil tooth itself was extremely deceptive. Even if one examines the tooth after reading all the literature about it, the tooth bears a compelling resemblance to human or hominid molar teeth, both in overall size and shape, and in the mode of wear on the tooth (the latter being the result of an abrasive diet and tooth-on-tooth contact). After comparing the Nebraska tooth with teeth of contemporary peccaries belonging to the species Prosthennops crassigenus, it is clear that the Hesperopithecus tooth is not an upper molar, as Osborn had thought, but a fourth upper premolar (a bicuspid in human dental terms). Keep in mind that all surface features, those essential to correct identification, had been virtually obliterated by heavy tooth wear during life and later by postmortem abrasion in the streams that deposited the sediments containing the Hesperopithecus tooth. The overall morphology of the Hesperopithecus tooth matches that of a P. crassigenus fourth premolar, but there is no similarity in the wear patterns of the two teeth. This is an important point, because the jaw motions of mammals are quite stable, and an animal that chews in a certain way would be very unlikely to change that mode of chewing and produce a novel wear pattern in its teeth. The only reasonable explanation is that the tooth of Hesperopithecus was rotated in the jaw in life, and that its odd position produced the primate-like wear pattern. This is not a totally ad hoc idea, because a 90 degree rotation about the long axis of a fourth premolar has been described and illustrated for the fossil peccary Dyseohyus sp. by Woodburne (1969, plate 51, fig. 1). Tooth rotation along all three axes has been described for a fossil carnivore (Mellett, 1977), so it is not an unexpected phenomenon in mammals, although it occurs only rarely. Ironically, the similarity between peccary teeth and those of hominids had been noted 13 years before Osborn published his description of Hesperopithecus. In 1909, W. D. Matthew and Harold Cook had the following to say in describing Prosthennops: "The anterior molars and premolars of this genus of peccaries show a startling resemblance to the teeth of Anthropoidea, and might well be mistaken for them by anyone not familiar with the dentition of Miocene peccaries." (p. 390) Matthew was Osborn's younger colleague at the American Museum of Natural History, and there is no way that Osborn could not have known about this 1909 warning. Matthew said very little about the identification (rather, misidentification) of Hesperopithecus as a primate; his published comments on the tooth stressed its stratigraphic position rather than its affinities. 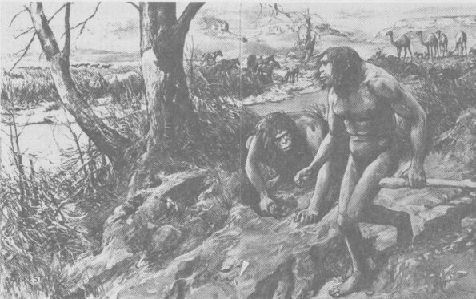 The consequences for science of the downfall of Hesperopithecus might have been more serious were it not for other substantial discoveries in the 1920's, especially Australopithecus and "Sinanthropus" (Peking Man), that helped shore up the argument for the evolution of humans from ape- like ancestors at a time when the concept of human evolution was being attacked by the likes of William Jennings Bryan. Osborn, in his role as an established American defender of evolution, went after Bryan in a March 5, 1922 article in The New York Times (Osborn, 1922a). Osborn optimistically believed that, "If Mr. Bryan, with open heart and mind, would drop all his books and all the disputations among the doctors and study first-hand the simple archives of Nature, all his doubts would disappear; he would not lose his religion; he would become an evolutionist." Osborn's answer to Bryan was published just nine days before the Hesperopithecus tooth arrived at the American Museum from Nebraska. The tooth seemed to be the very evidence he needed -- and from Bryan's home state! Here, perhaps, was the American ape that Bryan had chauvinistically and sarcastically wished for. Osborn's glee must not have been entirely scientific as he studied the tooth from Cook. Perhaps the opportunity to undercut Bryan colored Osborn's analysis of the tooth and perhaps induced him to rush into print prematurely. Five days later, just as the trial was beginning, Osborn produced another full-page defense of evolution in The New York Times (Osborn, 1925c). With Bryan's July 7 quote about the Nebraska tooth standing as a goad at the top of the article, Osborn nonetheless went through his entire argument without even a passing reference to Hesperopithecus. What had happened? Quite simply, Hesperopithecus had come to the end of its short life, although most of the world would not learn of the demise for another two-and-one-half years. By mid-July, Osborn had undoubtedly received the first specimens from the renewed collecting at the Hesperopithecus discovery site. This material, as we have noted, probably caused doubts in the minds of Osborn and Gregory over the reality of Hesperopithecus. And what if Bryan had found out about the uncertain status of Hesperopithecus? If such doubts had been raised at the Scopes trial, it could have led to disastrous consequences for Scopes's defense and even for the public image of evolution. Clearly, it would have been best for Osborn to back off and stay out of reach in New York. So, having fulfilled his obligation to Scopes's defense with the July 12 piece in The New York Times , Osborn sat out the Scopes trial, not even submitting written testimony. With one minor exception, Osborn dropped all mention of Hesperopithecus in published works after July 1925, and Nebraska Man sank into oblivion without a great outcry. Bryan died on July 26, just five days after the end of the Scopes trial, leaving no one of his stature to assume the leadership role of the Fundamentalist crusade against evolution. The Fundamentalists should have gotten some good ammunition from the Hesperopithecus episode. Even the editor of Scientific American had to admit that, "It looks as if Straton had morally won this round and it might possibly work out a lot nicer if we of the scientific camp were to concede it gracefully and get ready for the next one." (Anon., 1928e) In the same note, Gregory was praised for the retraction, "knowing as he must have known, when he did it, that the story of the ape's tooth that was reduced in station to that of a Pliocene pig, would surely be triumphantly intoned in the songs of hate of every anti-evolution gathering for a century to come." But this mistake involved mankind's origins, a topic that is inherently provocative, especially in the context of a creation/evolution conflict. Even after being corrected by scientists themselves, mistakes in descriptions of human ancestors are likely to be immortalized in the diatribes of the creationists. Whereas a few of the creationists' criticisms of the fossil evidence for human evolution are technically correct -- as in the case of Hesperopithecus -- they are often trivial. The reality of human evolution cannot be challenged by reference to one misidentified peccary tooth! Good science can be practiced only when inappropriate external influences, such as politics, are left out. It is clear now that Osborn's wish to embarrass Bryan may have clouded his scientific judgment and led him to describe a specimen whose affinities required a more restrained assessment. But Osborn was not alone in his error, particularly in dealing with the Order Primates, the group that includes monkeys, apes, and men. As Simpson (1945, p. 181) aptly put it: The importance of distinctions within the group [Primates] has . . . been so exaggerated that almost every color phase, aberrant individual, or scrap of fossil bone or tooth has been given a separate name, almost every really distinct species has been called a genus, and a large proportion of the genera have been called families. The peculiar fascination of the primates and their publicity value have almost taken the order out of the hands of sober and conservative mammalogists and have kept, and do keep, its taxonomy in a turmoil. Moreover, even mammalogists who might be entirely conservative in dealing, say, with rats are likely to lose a sense of perspective when they come to the primates, and many studies of this order are covertly or overtly emotional. But what creationists ridicule as guesswork, and trial and error, and flip-flopping from theory to theory are the very essence of science, the stuff of science. Error correction is part of the creative element in the advance of science, and when disagreement occurs, it means not that science is in trouble but that errors are being corrected and scientific advances being made. Creationism comes on the scene arguing that the Bible is inerrant as a source of scientific truth and that "creation science" cannot admit of error because it simply does not exist. Research for this article was supported in part by NIH grant RR00167 to the Wisconsin Regional Primate Research Center. We thank Morris F. Skinner for providing us with much information about the complex stratigraphy of western Nebraska.